Tomorrow is the birthday of a good friend and I had planned to make her a shirred, ruffled scarf as a present as seen on MADE. I have tried shirring once before with limited success, but I thought it would be OK this time. It wasn't. When I put the shirring elastic inside the bobbin case, it is held tightly by a clip on the outer case and is pulled so tightly that the elastic just breaks when I try to sew with it. I have fiddled and fiddled with this method but can't seem to fix it. I don't know if it just the old machine, but I suspect it is the design of the bobbin case. 3. Thread the shirring elastic through the cord hole (leave 1-2cm elastic hanging out the back to tie off later). 4. Sew a few stitches close together until the elastic feels secure. 5. Stretch out the elastic and sew! 6. At the end of the fabric, leave 1-2cm of elastic to tie off later. 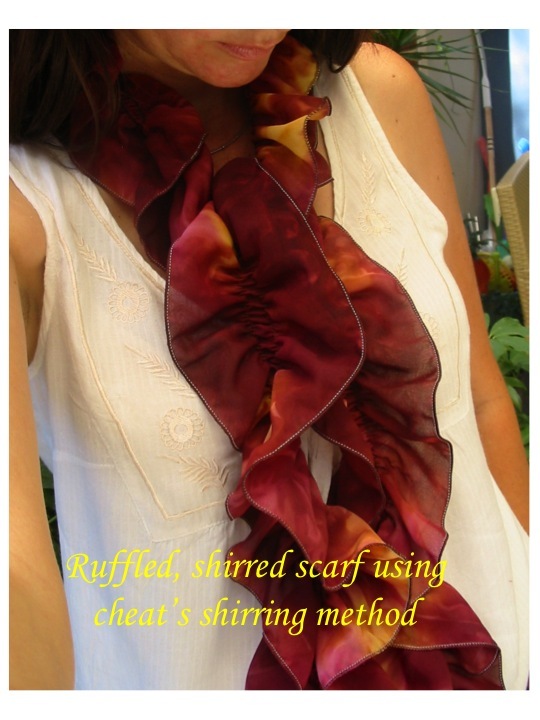 I sewed two lines of elastic close together down the middle of the scarf (see below). At the top and bottom ends of the scarf, I tied the loose ends of elastic together and trimmed them close to the knot. I decided to make a matching card. For this I cut out heart shapes from scraps of fabric, arranged them on a blank card and sewed them on with one line of stitching - how simple is that!? your cheats shirring method is the industry standard I believe. I love your do it now attitude and that you make jeans! I need to get my sewing room happening and get back into it. Just bought a set of feet for my machine - I wanted one for rolled edges and for just a bit more I got a whole set - so I wonder if there's afoot like yours in it? Very ingenious.